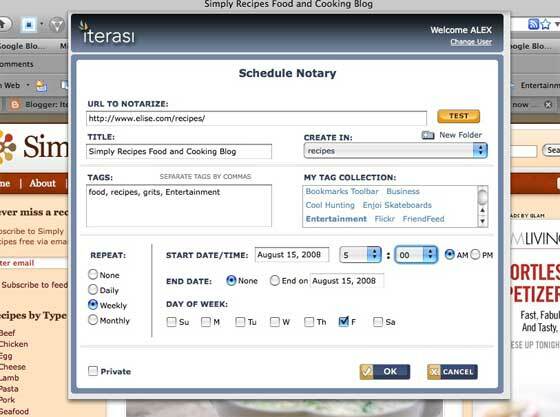 Portland based Iterasi launched in early 2008 to allow users to create on the fly bookmarking of entire web pages (not just the URL, the entire web page with images). Instead of the Delicious approach of simply bookmarking a URL and some descriptive data, Iterasi let users create a Wayback Machine like copy of the webpage, including with dynamic alterations from being signed in, cookies, etc. Here’s an example save of the TechCrunch site I created earlier this evening. Saved pages can also be embedded via an iFrame. The page save is done via a browser plugin. Until today Iterasi only worked on Windows machines via IE or Firefox. Today the site expanded to Mac machines (Firefox only), opening up the service to new non-Windows users. More importantly, they also added scheduling. Prior to today users had to manually bookmark a site. Great for a one-off, but if you want to scroll back and view how a site changed over time you had to remember to go there periodically to set a save. Not any more. Users can now schedule automatic saves of sites as often as daily and add them to folders, tag them, sort by date, etc. Also, all pages are fully indexed and searchable. Iterasi is completely free, although founder Pete Grillo says they may add a premium option down the road. On the downside: There is no way to auto-set all saved pages associated with an account to private, although each save has a privacy setting. Since the default is public and the page saved is dynamically generated via sign on and cookies, some private data can be exposed (hit save when you are on an open Gmail page and all your email headlines are public if you forget to set it private). Also, for a number of reasons Iterasi does all the bookmarking on the user computer, meaning scheduled saves only occur if your computer is on. If not, Iterasi takes the bookmark when you next turn your computer on. Users who don’t leave their computer on regularly won’t fully appreciate the service.